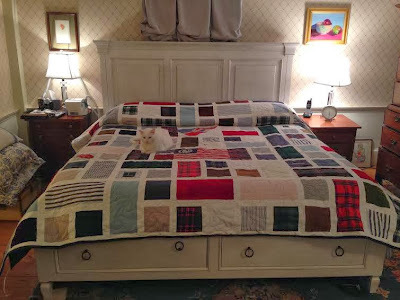 This quilt was made for the Levine Family in honor of Larry Levine, the clothing designer. 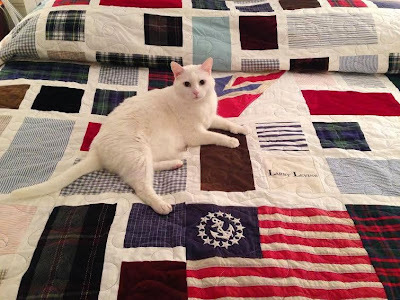 In this King size quilt are many labels of the Levine brand, his yacht flag, his cashmere scarves, a leather jacket, and as you can tell Koko his cat loves the quilt and so does the Levine family! "Our family just loves our new quilt"
"Michael and I just opened the quilt and it is incredible. He is putting it on the bed right now and we will take a picture. Thank you. This quilt means so much to me for a lot of reasons. Some of them are rather complex. But just know that I am grateful. Michael just came in and said "It is stunning. It is so beautiful I just want to cry". And he never knew my father. Thank you!"